Michael Scott: Why are you here? Dwight Schrute: When Darryl was coming, you said you wanted me here for protection. Michael Scott: Not. I said, not that. When it first came out I gave The Office US a pass and didn't think much of it as all I could do was compare and contrast with the UK version. A month or so back I decided to take another look because I figured that, after five seasons, it must be doing something right. Starting again with season 1 I found again that it was a poor copy, trying to replicate the UK version but failing to do so, partly because it didn't really want to do so but felt it should. Season two does not repeat that mistake and, by the halfway point I no longer felt that it deserved to be compared to the original so much as just be judged on its own merits. Although the awkwardness of the first season is still part of the comedy, it is no longer the "painful" embarrassment that it tried to copy from the original but rather it plays like a more confident US sitcom. The device of the film crew remains constant but the material is a lot more comical than season 1 and seems a better fit in terms of the characters and aims of the series. To a point the season could be put down as a series of 20-minutes sketches because each more or less does serve as a standalone episode with a central idea at the core but the show does well to integrate threads across the season. The most obvious of these is Jim and Pam's flirty friendship thing and this works better here than it did in the UK version, partly because the writers perfectly capture this type of relationship but also because the tone of the show allows it to happen by being warm rather than bitter in its comedy. This is not a criticism of the UK version but it is simply true that in the US, this works better because the American psyche is a bit more positive and "big" whereas in the UK the comedy of embarrassment and awkwardness just sits better with who we are! As a result of doing what it wants to do rather than what it feels it should do, the show gains confidence and is very consistent in what it does. It has its high points that are hilarious but mostly it is just consistently pretty funny and each episode threw me plenty of chuckles and a couple of good big laughs. 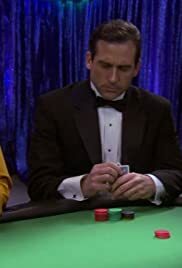 This is helped by the show utilising the supporting characters to do more than awkwardly look away in silence when Michael does something shocking (although they still do that). Instead each person gets fleshed out a bit and given a lot more material, which is fair enough and also allows for the office to feel fuller and less reliant on one or two characters to deliver laughs and plot. Of course the main characters remain that way and the cast do well with this. Carell seems a lot more comfortable with his character rather than he did in season 1 because it suits his style better. As a result he is funnier and a lot more likable even if he is still very much a jerk with no self-awareness. Krasinski doesn't grip me as an actor but he does make for a very real person and I like him for that. He works well with Fischer, who does her stuff very well, whether it is being shocked silence or being overly close to Jim – the two of them together make the office relationship aspect work. Wilson is better as well as he has better material including some awesome lines (the one about smiling and monkeys is a killer and a good example). The example of using the other characters more is best seen in Kaling' Kelly, who has gone from being "the Indian women to allow Michael to be racist" to being a ditzy valley girl type who is a very funny character and a dream-world of romance in her head. I like her a great deal and she makes for plenty of good asides during each episodes. Novak benefits from this and he does well with a Jim-esquire character of being trapped. Baker, Baumgartner, Kinsey, Bratton and many others all step up and the show benefits by having much more of an ensemble feel that adds to the impression of a show growing comfortable with itself. Season 2 is not an awesome affair and I wasn't wiping tears from my eyes but it is still very consistent and pretty funny, while delivering good big laughs here and there each episode. From season 1 the show now feels like its own creature and is doing what it wants to do rather than just copying The Office UK in a way that doesn't work. The result is more enjoyable and entertaining and I look forward to season 3 for more of the same.